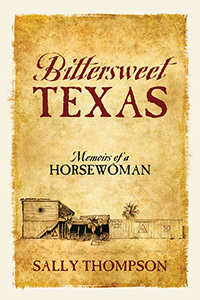 Sally Thompson’s “Bittersweet Texas: Memoirs of a Horsewoman” is the story of Sally, a young woman nearing 30 years old and working part time as a bartender and songstress at her family’s restaurant at a popular port with sport fishermen and oil companies on the Gulf of Mexico. She meets a mysterious oil supply boat captain, which will change both of their lives as they face an uncertain future. Previous Previous post: Ring in the Season With a New Digital Edition! Next Next post: Take In the Sights—And the Sales—With a Virtual Book Tour!